Khodorkovsky testifies as witness in YUKOS subsidiary’s case | Russian Legal Information Agency (RAPSI). MOSCOW, June 2 - RAPSI. Mikhail Khodorkovsky testified in court in Moscow today that Antonio Valdes-Garcia, the former head of Fargoil, a subsidiary of YUKOS, was not authorized to issue orders for oil refining operations. The Fargoil case was severed from the joint prosecution of former Ratibor president Vladimir Malakhovsky and Vladimir Pereverzin, deputy director of YUKOS External Debt Directorate, who were sentenced to 12 and 11 years in prison, respectively. Malakhovsky and Pereverzin participated in fraudulent bidding for oil from Yuganskneftegaz, Samaraneftegaz, and Tomskneft VNK. They acquired oil at artificially reduced prices, which they resold for profit. Ratibor, Fargoil and other companies were consolidated subsidiaries of YUKOS, Khodorkovsky said. He added that subsidiary companies were established in order to simplify the management process. 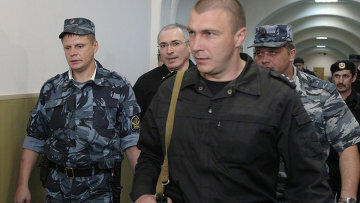 Khodorkovsky emphasized that YUKOS was the actual owner of the oil used by its subsidiaries, as it was the one that profited from the oil and paid taxes on the profit, as commercial courts acknowledged on several occasions. Meanwhile, Khodorkovsky agreed with investigators that Fargoil participated in fraudulent bidding held at the request of regional governors. 16:58 02/06/2011 Mikhail Khodorkovsky testified in court in Moscow today that Antonio Valdes-Garcia, the former head of Fargoil, a subsidiary of YUKOS, was not authorized to issue orders for oil refining operations.